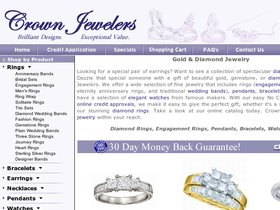 Crown Jewelers is a leading online credit jeweler, and requires no prior credit history to qualify for an account. Crown Jewelers offers rings, bracelets, earrings, and more. Crown Jewelers has been in business since 1988, and thousands of customers have found Crown Jewelers to be their online jeweler of choice. Save on your next purchase from CrownJewelers.com with discounts, coupons and savings from 58coupons.com. Rest easy - when you make a purchase from CrownJewelers.com they ship your order fully insured. Act now to save 40% from Crown Jewelers with this coupon code. Shop the Specials section at CrownJewelers.com where you can save up to 60% on some gorgeous items. Click link to shop bridal sets on Crown Jewelers, now up to 50% off. Enjoy a Free Gift Box with every purchase from CrownJewelers.com.